The college received a $20,000 grant from the Dorothy D. Smith Charitable Foundation and a road tractor from Givens Transportation, both of which will allow the program to better serve students. 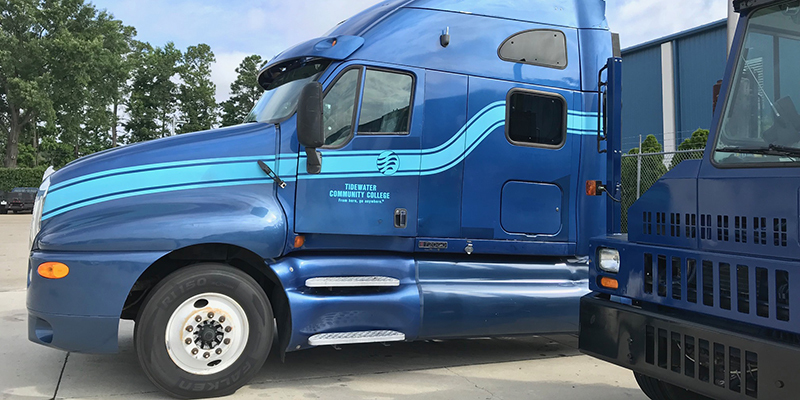 Tidewater Community College’s truck driving program received two significant gifts that will allow the college to better serve its students to fill the growing national demand for more drivers. Givens Transportation donated a three-axle sleeper road tractor that will expand TCC’s current fleet of trucks and offer students the ability to learn on a new type of vehicle transmission. TCC also received a $20,000 grant from the Dorothy D. Smith Charitable Foundation that will allow the college to refurbish its current fleet of trucks. According to the Occupational Information Network, Virginia estimates more than 900 annual job openings for tractor-trailer truck drivers by 2024. In 16 weeks, students who complete TCC’s Career Studies Certificate in Truck Driving can be on the road to a new career. “We hope that our donation will help ensure the continued success of the Tidewater Community College truck driving program,” said George Woodruff, corporate recruiter for Givens Transportation in Chesapeake. Grant funds from the Dorothy D. Smith Charitable Foundation will also be used to upgrade the software for TCC’s driver simulators. State-of-the-art electronic aids used in today’s industry will also be added to the college’s trucks. “Our trustees really value the importance of our trucking industry and the hard work the drivers put in, and they wanted to lend their support to that effort,” said Robert Fox, senior vice president and philanthropic fiduciary manager at Philanthropic Solutions at Bank of America. Fall classes begin Aug. 20. Coursework qualifies students to obtain their Class A CDL (commercial driver’s license) to operate a commercial vehicle from the Virginia Department of Motor Vehicles. For information on enrolling in TCC’s trucking program, contact instructor Matt Isaac at misaac@tcc.edu or enroll@tcc.edu.